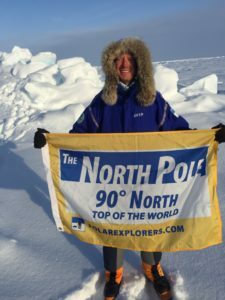 West Palm Beach partner Harvey E. Oyer III was part of an international expedition of adventurers who cross-country skied to the geographic North Pole in April. The team departed from the northernmost city in the world—Svalbard, Norway – aboard a Russian Antonov 74 cargo plane that dropped them at a Russian military ice camp above 88° North latitude. Oyer was accompanied by a guide and four other international adventurers. On April 20th, after seven grueling days of crossing pressure ridges, piles of ice rubble, and open Arctic Ocean in minus 40°F temps, the group of six reached 90° North. Despite frostbite and injuries, they all returned home safely. Harvey E. Oyer III is a partner in the West Palm Beach office of Shutts & Bowen LLP, where he is a member of the Real Estate and Land Use & Zoning Practice Groups. He is a fifth generation native of Palm Beach County, served as a Captain in the United States Marine Corps, and is an award-winning children’s book author.